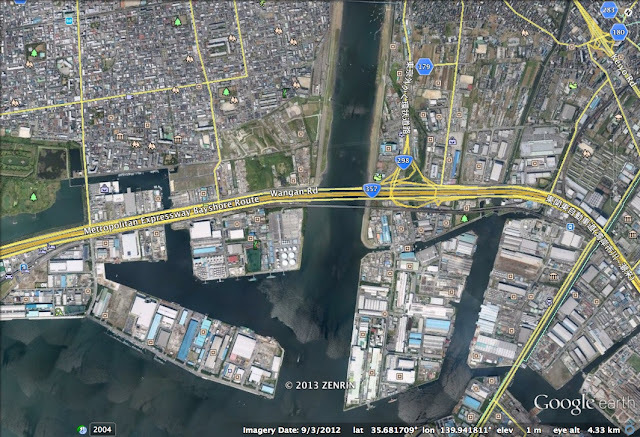 The last four bridges across the Edogawa are three expressway bridges and a railway bridge all sitting side by side. The first bridge is a steel girder bridge carrying the eastbound lanes of the Wangan Expressway (Route 357). The next bridge is the Metropolitan Expressway Bayshore Route. This bridge was being extensively retrofitted for earthquakes when we were there. The next bridge is another steel stringer bridge carrying the westbound lanes of the Wangan Expressway (Route 357). The final bridge is another Warren truss bridge carrying the Keiyo and Musashino Lines of Japan Rail. The Google earth photo below shows all four bridges clustered together where the Edogawa empties into Tokyo Bay. The area along the river has switched from residential and commercial to industrial along the Bay. Readers can see these same highways crossing the Arakawa and the Sumida-gawa in earlier web postings about Tokyo's bridges. Tokyo Prefecture, Japan's Bridges: Bridges across the Edogawa at Tokyo Bay by Mark Yashinsky is licensed under a Creative Commons Attribution-NonCommercial-NoDerivs 3.0 Unported License.